LOS ANGELES — Von Miller strolls into Milk Studios the morning after The ESPYS. He’s rocking gray basketball shorts, a white tee and a blue Supreme fanny pack strapped across his left shoulder. And, of course, his patented clear framed glasses. Fashion is one of the many galaxies in Miller’s universe. The Hollywood studio rests a mile from the legendary Palladium, and Miller’s there for a promo with the apparel brand Carhartt. The night before, the Denver Broncos linebacker had worn a tan Carhartt-designed ensemble. Miller is the NFL’s Dos Equis Man — a transcendent athlete with an inviting personality. He looks every bit the modern-day gladiator, quarterback terrorist and surefire future Hall of Famer who’s tallied double-digit sacks in six of his first seven professional seasons. But engage him in a conversation and football is often the last topic that comes up. Miller is far more than the logo on his helmet. For instance, there’s his love of the hit Starz series Power and HBO’s Game of Thrones. Von Miller at Milk Studios during a recent shoot for the brand Carhartt. He’s got takes about Drake’s record-setting new album Scorpion too. Milk is spacious, with a dizzying number of directors, producers and camera operators setting up for what figures to be an all-day event. Of course, the wardrobe options are limitless. Overalls, shirts, jeans, boots, hats. There’s even an intricate bow and arrow lying around on a metal table with far more innocent items such as water bottles, pens and a menu for the cafe located outside the studios’ double doors. There’s also wildlife: dozens of chickens, a bald eagle and a fox. The setup is largely a reflection of Miller’s upbringing and energy — a country boy from Dallas, raised with the principles of loyalty and hard work by his parents, Von Sr. and Gloria Miller (more on them later). He received his degree from Texas A&M in poultry sciences. He even started a poultry farm at his 38-acre Dallas home. Many people prefer their chicken with lemon pepper. Not many would prefer a live chicken in their lap — which Miller eventually enjoys once the shoot starts in one of the afternoon’s many scenes. The reality is the truth he’s always known. There’s no one quite like Vonnie B’Vsean Miller Jr. The NFL veteran is Carhartt’s co-creative director. He helped frame the ideas and script for the commercial, which is set to air Labor Day weekend. The goal is to honor hardworking men and women in various walks of life. He and Carhartt’s creative and directorial team created the vision at Miller’s Denver home after OTAs earlier this spring. 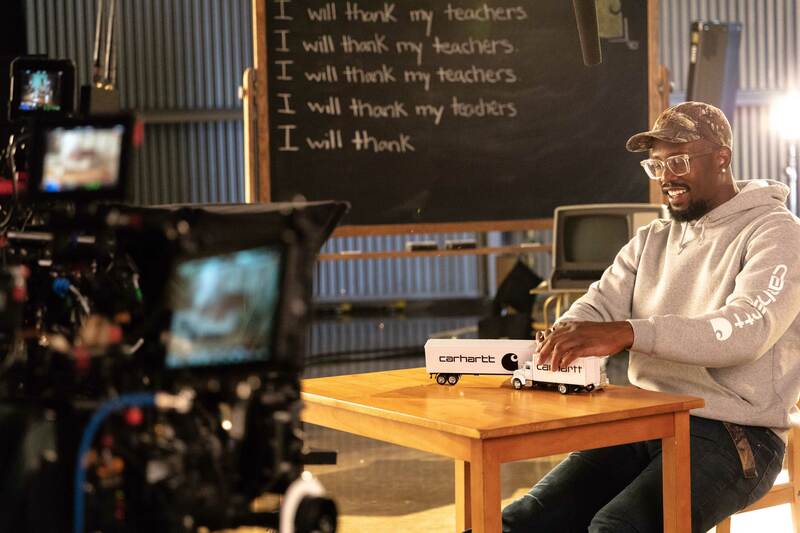 From pop culture icons such as Tupac Shakur, Eazy-E and Rihanna, appearing in movies such as The Fast and the Furious, to everyday folk such as farmers, car mechanics and men, women and kids from inner cities, Carhartt’s diversity is storied. It’s a utilitarian global brand catering to the needs for durability — Miller in a nutshell. Celebrity photographer Victoria Will makes a portrait of Von Miller during a recent advertising shoot for the brand Carhartt at MILK Studios. 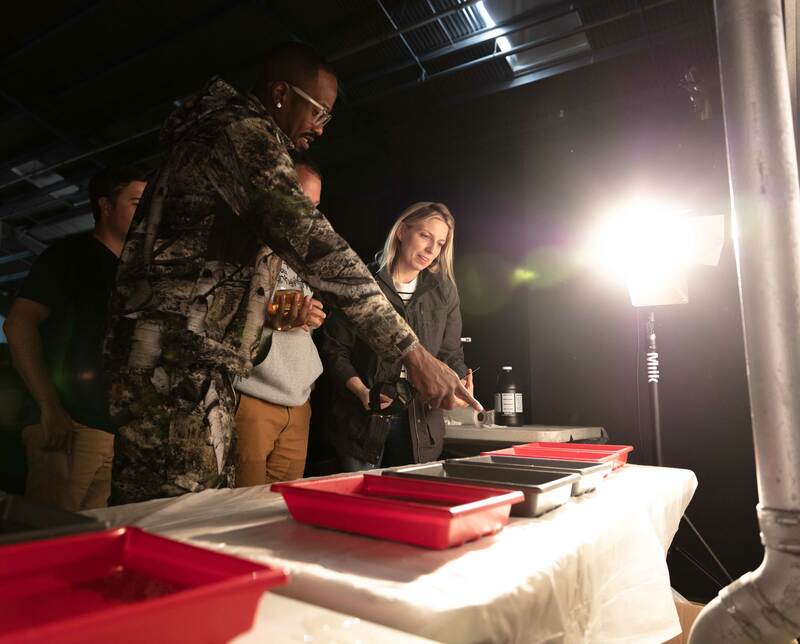 Von Miller and celebrity photographer Victoria Will choose prints during a recent advertising shoot for the brand Carhartt at MILK Studios. Scared isn’t the right word, but there was a collective uneasiness in Milk when it came time for filming with a 26-year-old bald eagle named Emma. A sea of cellphones recorded Miller and America’s national symbol. There they were, two Super Bowl champions, an eagle and a Bronco. Instructions are repeated at least 10 times before filming. There’s no room for negotiation either. Even though her caretaker held her on a protective leash for roughly 15 minutes, a fear of her claws and eyes as menacing as Miller staring down an opposing quarterback on a crucial third down commands respect. Miller doesn’t share in the anxiety — he laughs when Emma slaps him with her wings while he runs through his lines. That’s Miller in a nutshell: calm in the moment and laughing because he enjoys a life he knows he both earned and was blessed with. Three hours into the shoot, Miller’s parents, who recently celebrated their 30th anniversary, walk in. By now, the eagle is back in its cage and headed out the back exit. Miller’s on the other side of the studio doing a photo shoot. The flash from the photographer is enough to temporarily blind everyone in the studio. It takes a second to readjust, regardless of where a person stands. It’s that bright. How does Miller handle it without flinching? Pure Dos Equis Man swag. One flash gets the best of him though. His eyes still squinting, he looks off to the side and asks a simple question. Almost as if he can feel the energy in the room shift. She doesn’t say anything. She doesn’t have to. Her smile speaks a thousand words. At this moment, he’s not Von Miller the Super Bowl 50 MVP, the overall 99 player on this year’s Madden and the league leader with 83.5 sacks since he was drafted in 2011. He’s just a grown kid happy to see his mom. His dad, a few steps behind, beams with pride as he talks with Bennett about the progress of the shoot. Everything is a family affair with the Millers. When Miller was younger, he didn’t pay much attention to the fact that he had both parents in his life. As he got older, and worked and studied alongside peers with different household dynamics, Miller learned that his reality was a fantasy to others. Turning 30 in eight months is ushering in a welcome sense of enlightenment too. His spirit animal is the owl because of its intuition and knowledge. In a world full of darkness, he says, you have to be able to see. 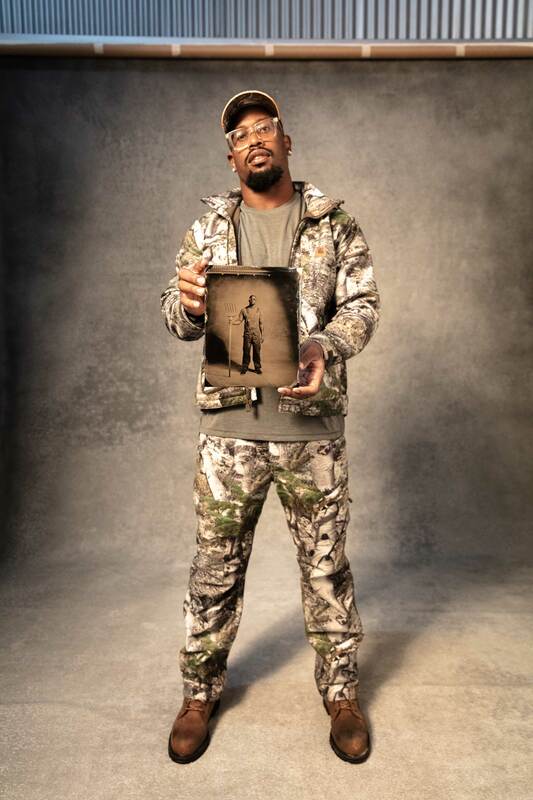 Von Miller poses with a finished wet-plate print of himself at Milk Studios. One of Miller’s responsibilities at Milk is the playlist. His musical taste doesn’t discriminate. He’s a fan of everybody. As of late, he’s been getting into Quentin Miller. “If the s— is hard,” he says, “I like it.” Today, though, Future is a mainstay. Dirty Sprite 2 and this summer’s Beast Mode 2 play straight through. Miller’s quirkiness is both engaging and charming. But his self-awareness sits on the same platform. While he’s on set, news breaks that the Miami Dolphins plan to suspend players up to four games for protesting during the national anthem. A day before that, Tennessee Titans Pro Bowl defensive lineman Jurrell Casey became the first player to announce he would protest during the upcoming season. Miller, the only defensive player in NFL history to win both Super Bowl and Pro Bowl MVP honors, voiced his frustration last September in response to President Donald Trump calling players “sons of b—-es” for their protests. “We felt like President Trump’s speech was an assault on our most cherished right, freedom of speech,” he said. “We felt like, as a team, we had to do something. We couldn’t just let things go.” Miller and 31 of his teammates took knees last season before a game against the Buffalo Bills. His decision to do so complicated negotiations to renew his endorsement contract with a local car dealership. Miller’s passion still burns a year later. In December, he was awarded the Broncos’ Community Impact Award for work through his Von’s Vision Foundation, which provides eye care and corrective eyewear to low-income children. Since 2012, the organization has raised $3.4 million, including $1.1 million in 2017, and offered eye exams, frames and lenses to children. As of the end of 2017, more than 6,000 students in Denver received free eye care as a result of Von’s Vision. But there’s a provocative level of nuance that comes with the public’s expectation of players to protest. “I wanna help the people that can’t talk. I wanna spread the message and do whatever it takes to help my brothers and sisters. We have a voice for others that really have none,” he says. It’s late afternoon, the point in the day when traveling anywhere in Los Angeles is futile thanks to traffic. Miller’s day is halfway done, but he’s thinking ahead. It’s his last “off day” before getting back to the grind that has made him the highest-paid non-quarterback in the league. ESPYS week used to be a week off for him, but now it’s only two days. It’s back to working out after he and Carhartt satisfy all their responsibilities together. Training camp starts in a week. The self-proclaimed “Slayer of QBs” was voted the ninth-best player in football by his peers — one of only two defensive players in the top 10, along with Los Angeles Rams defensive lineman Aaron Donald. While still at the peak of his powers, Miller is aware there’s more in his career’s rearview than dashboard. He’s been thinking about life after the NFL since before he was drafted. Don’t get it twisted though. It’s still hard on a quarterback whenever No. 58 is on the other side. CORRECTION: This article has been changed to correct Miller’s relationship with Carhartt. His position as a creative director is ongoing, not just for the one day.